Not an auspicious beginning. It’s dry and gummy at the same time. The dressing is undetectable. 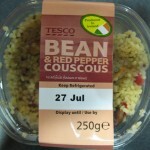 I want this to be good because vegetarian sides (other than slaw) are rare at my Tesco. It even has beans, another rarity, but not many. 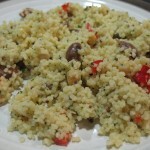 It’s really more “Couscous with a few beans and red peppers.” The entire tub contains 500 calories and 20g of fat, which isn’t bad, but it’s not really worth eating. This Tesco used to have an actual prepared-salads bar with some pretty good stuff, then one day it was gone. Every little helps!